Little Genius Boy arrives in town for a Saturday-night special, surfing on the hood of his limo looking every bit the itsy Mick or the honky Prince and sounding like a glorious combo thereof, spewing out rhymes that'd make Eminem eminenvious, dropping Mantronix beats one minute and Keith Richards riffs the next but sounding like no one but himself. It's been said: He sounds like everything and he smashes it all together, and people either gush or guffaw, amazed or annoyed that not only does he sing and rhyme and compose and steal, he also acts. This time around, on Midnight Vultures, he acts a fool, a playa, a B-Boy, a robot and a rogue; a dumbass womanizer and a Quiet Storm seducer. He's discovered the power and humor inside the falsetto and abuses them to no end. He's polished the booty-licious power of funk and the Family Stone, of Stax horns and electro, then messes it all up until it's Beck and only Beck. Not that many people realize that there's a direct, wonderfully short line connecting Beck Hansen with John Cage, the line being Beck's grandfather, Al, who worked with Cage, attended Cage's classes and wrote about these experiences (you can read about them in the John Cage Anthology). Some of Cage's ideas must have dribbled into Beck's brain, cuz he ended up being a sort of Cage multiplied by 1,000, resampled and distilled, given the funk and filled with noise. Beck is the perfect use of "4:33," Cage's most famous, and most revolutionary, gimmick (and perhaps ground zero -- should we stomp on his grave? -- for late-20th- century performance art). 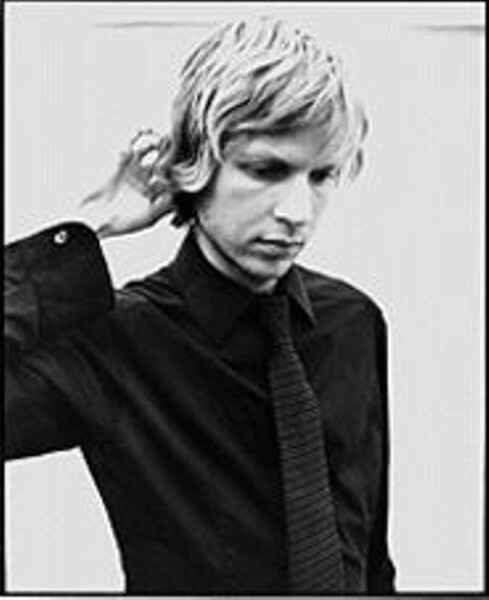 Most important, Beck has taken the idea of noise-and-extant-sound-as-music and stuffed it to the gills with pleasure and "let's party!" joy, and though scholars may guffaw at the notion and file him away as a lowfalutin' version of Cage's high-and-mighty ideas, he is this way deliberately so. It was a joy to see John Cage Dada on the ever-embarrassing American Music Awards last week: Smushed between sublimely ridiculous performances by 'N Sync and Christina Aguilera -- dozens of dancers, all locked-synchronized-pound-pound-rhythm doing the Madonna thang and pumpin' pelvis -- was a performance by Beck that was so funny and stupid and curious that it deserves mention. It zipped by (intentionally so, no doubt). There was Beck doing "Mixed Bizness" with his band on the huge stage. He was clad in tattered bellbottoms, a long-sleeve T and a knitted scarf (no doubt the clothes he pulled out of the hamper that morning), and his band members looked more like Captain Beefheart's Magic Band than your standard LA studio band. One of them was shrouded in a monk's hood, one wore a Foghat concert T and the others whizzed by on the camera with nary a still shot. But the best part was Beck's version of synchronized dancers: One did a stupid Curly spin on the ground, another basically sprinted back and forth across the stage and one did the stealth soldier scramble, crawling and ducking, carefully sneaking toward an imagined enemy on the other side of the stage (With any luck, the gun was loaded and the target was Lenny Kravitz). Midnight Vultures ain't doing so hot on the Billboard charts; it's hovered at the same place -- somewhere in the 70s -- for the past few weeks and will probably continue to. It doesn't have the grab-your-balls stupidity of Blink 182 or Limp Bizkit, so the true dumbasses aren't going for it. But, as always, the critics (including this one, in case you haven't noticed) lap it up because it's so damn lappable, and so damn smart, and so damn engaging. Damn. Makes you wanna get all retro and party like it's 1999.